When I started reading The Punisher stories written by Garth Ennis, I was convinced that this man surely hates superheroes! In his stories Punisher is much like a maniac, obsessed with killing, and there’s very less humanity left in him. Frank Castle is merciless, and he kills his long-time side-kick, Micro in one of the first few stories. 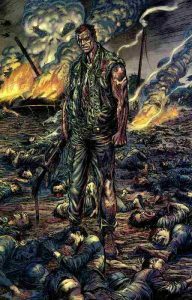 Garth Ennis wrote about Frank Castle’s almost every stage of life: his life as a soldier in Vietnam, his return from the war, and his personal war with the crime. Garth Ennis also wrote DC Comic’s Constantine stories, Hellblazer, in 1991. Garth Ennis’ landmark work is widely considered to be the Preacher, which was a 66-issue story arc. Garth Ennis’ stories are often considered to be male-centric by many! “However, Garth Ennis wrote an eight-issue story Goddess which was published by Vertigo/DC Comics”. 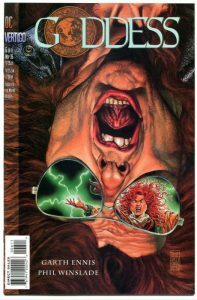 Garth Ennis wrote about Rosie Noland, a woman, who realizes she is a deity and she claws her way up in the world of appalling gore and nastiness. There are some realities that Garth points out in the story. As always, Garth didn’t make the protagonist all-good. Let’s talk about Garth Ennis’ version of Punisher. Marvel Comics’ anti-hero, The Punisher, was somehow living among the “real” superheroes like Spider-man, Thor, and Captain America etc. Sometimes appreciated, sometimes ignored – The Punisher wasn’t taken much seriously before Garth Ennis. It’s not like The Punisher didn’t matter at all in the Marvel universe. Garth Ennis made the character so distinct and so clear that anybody who read the Garth Ennis’ stories of The Punisher would instantly connect with him. You can interpret it however you like, but the story clearly pointed out one fact that The Punisher was born in the war overseas and the tragedy just gave him an excuse to kill again. That was probably Garth Ennis’ intention. He tried to prove a point that the scars of war go deeper and it changes a person, someone like Frank Castle. Garth Ennis is one of my favorite comic book writers (the list is quite long actually!) who is not afraid to dissect a character and break it and then rebuild it. He will make the character dark, bleak, and violent and somehow he never fails to amaze his readers.